The International Union of Property Owners (UIPI) has held its annual International “Property Day” to discuss the judicial protection of property right and excessive taxation upon real estate. 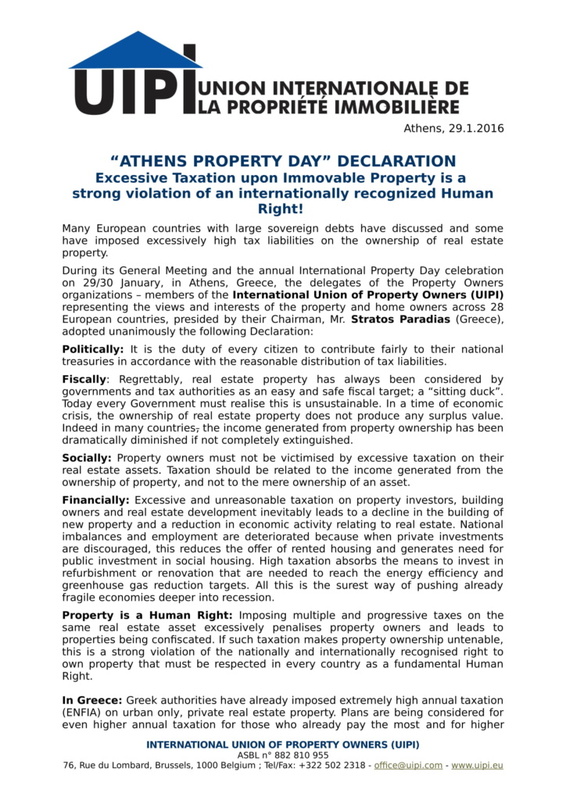 The UIPI met in Athens, Greece, for its annual International “Property Day” official celebration on 30 January 2016. The event was hosted by the Hellenic Property Federation (POMIDA), and organised next to their annual congress. It brought together more than 400 POMIDA members and representatives from sixteen property owners’ associations across Europe. The keynote speech was held by the Mayor of Athens, Prof. Giorgios Kaminis, a Law Professor and former Greek Ombudsman. On behalf of Christos Rozakis, the former Vice President of the European Court of Human Rights who joined later that evening, he presented the evolution of the judicial protection of property rights since the adoption of the European Convention of Human Rights. He pointed out that the right to property has grown into one of the most important rights contained in the Convention, judging from the number of appeals submitted to the Court Registry each year. The Mayor of Athens also shared his view on the need to stop the deprivation of properties. UIPI delegates also met with the President of the Republic of Greece, Prokopis Pavlopoulos, who strongly stated that: “The protection of property right is the basis of every democracy”.